Hello ... Hello ... my old friends ... It's great to see you once again! 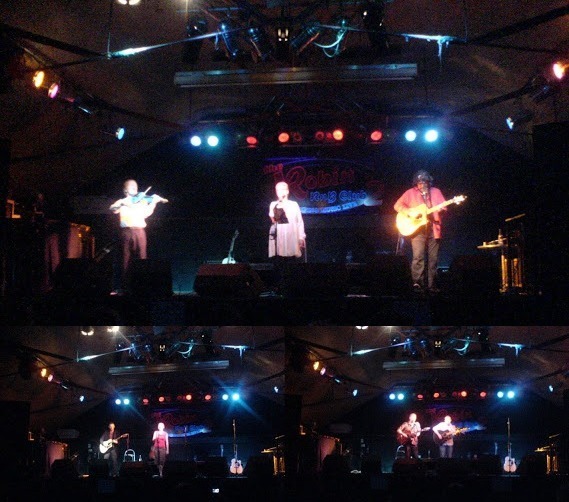 My third Beatles Blues & Blue Violin Project [BBBV] gig at The Robin 2 in Bilston last night [Sunday 11th April] was a delight in more ways than one. Yours Truly KJS thought that there might be little to add after attending and reviewing the BBBV concert in Shrewsbury last Thursday [7th April] but felt this morning it most important to remind folks in the ELO and Beatles universe of what they are missing if they somehow do not catch the BBBV tour - either this Spring or during Phase II of their tour later this year in September. BBBV were ably assisted on the night "with a little help from their friends" Fay & Latta and Groucutt & Haynes. The highlight of the Fay & Latta set for me was their beautiful song "Uninvited". Groucutt & Haynes also delivered a hugely impressive selection of songs highlighted by their class song "Rain". And what more can I say of BBBV? Only that they improve performance after performance and that it is a real pleasure to again witness the craft of ELO violinist Mik Kaminski in a variety of musical styles and improvisations that one can clearly see him enjoying. Phil Bates' top notch guitar work effortlessly intertwined with Tina McBain's sublime vocals, particularly on tracks like "Motherless Children", "While My Guitar Gently Weeps", "Why Worry" and "Midnight Blue" here in the home territory of the late great Kelly Groucutt. In summary, another great night of ELO and Beatles fused music, this time hosted by our friends at The Robin 2. It was also nice to spend a little time with fellow fans and some of my musical heroes. We really should support in numbers these talented musicians as they ply their trade and bring us the live music of The Beatles and the Blues with a certain blue violin! ELO Beatles Forever [ELOBF] recommends The Beatles Blues and Blue Violin Project [BBBV] to those enlightened folks who also like ELO, Jeff Lynne, Roy Wood, 'Brum Beat', The Idle Race, The Move, The Beatles and related artistes.